This is the second of 7 “scenes” depicting each of the pieces of the armour mentioned by the apostle Paul. Putting on the whole armour of God protects us in the battles of life & faith. I enjoyed drawing & colouring up this illustration, although it was quite a challenge to get the shadows & highlights in the right place, to give the sense of the metal armour having been beaten into the muscle shape of a man in the breastplate. I think I’ve managed to achieve that effect though! The Breastplate of Righteousness: what is it & what’s it for? … and the body armour of God’s righteousness. From these additional references we can conclude that the Breastplate of Righteousness is heaven sent body armour, strong & resilient, intended to protects our bodies. It was often the second item of clothing/armour to be put on by a Roman soldier, after the belt. Christians understand that we are not able to become righteous by our own efforts. Wrong-doing (sin) is all too easy & tends to mar our efforts to live a sinless life. God knows that we are incapable of living a sin-free life, that is why God the Father sent his Son Jesus the Christ (or Messiah) to earth. The life, death & resurrection of Jesus creates & eternally maintains a divine exchange which is available for anyone who chooses to accept it: Jesus dies in our place, the sinless man, for the sinful ones. In that exchange our sins are taken on by Jesus (on the cross) & his sinlessness is given (or imputed) to us. That’s an amazing thought & an astonishing gift! From this theology it should be clear that the righteousness we are talking about is not our own, it is Christ’s righteousness imputed (or credited) to us, which means we are now sinless. This happens as soon as we become Christians. Although we still do wrong (sin) after we become Christians, all is not lost! All we need to do to become sinless once more (in God’s sight) is to confess that wrong-doing & Jesus’ sinless account is again debited into our account: we can again become sinless. The righteousness referred to in the Bible (& specifically in Ephesians 6 above) is both 1) the righteousness that comes to us at conversion (see Romans 3:24  & Romans 4:5 ) AND 2) the sanctifying righteousness of Christ continually practiced in a believer’s life (see 1 Corinthians 1:30 ). The righteousness we receive from Christ comes to us at conversion, & continues in us all through our Christian life, continually available, & continually recovering us. The righteousness that comes to us at conversion is also called justification… which can be defined as “just as if I’d never done it!” At the point we become Christians, all our record of past sin is removed, instantly, & we become righteous (sinless) at that point. We remain sinless (justified; righteous) as we confess our sins (wrong-doing) & accept the gift of God, the complete pardon from those sins. The breastplate (or body armour) in ancient warfare was a large piece of thick leather, which protected the front of a soldier’s body. Later in history, bronze was used to increase the protective nature of the armour. Then iron & steel was employed to provide better protection. The breastplate could be a single piece, or even be a leather jerkin, with overlaid rings of metal (chain-mail) or many small shields attached to the jerkin (scale mail.) If it was available to him, no soldier would go into battle without his body armour. It has been noted by some history commentators that Roman soldiers had no armour on their backs, meaning that they must always face their enemy head-on, to maximise their armours protective capabilities. In later years, as greater protection was required, a back piece was fashioned & attached to the front breastplate, protecting the body from assaults from behind the soldier. 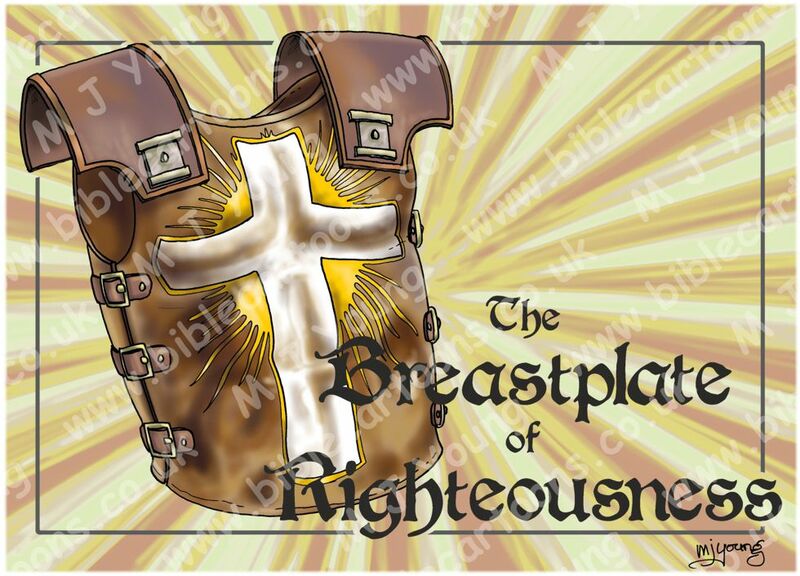 Note: my depiction of the Breastplate of Righteousness has both front & back pieces. Application: why a Breastplate of Righteousness? 21 But now a righteousness from God, apart from law, has been made known, to which the Law and the Prophets testify. 22 This righteousness from God comes through faith in Jesus Christ to all who believe. There is no difference, 23 for all have sinned and fall short of the glory of God, 24 and are justified freely by his grace through the redemption that came by Christ Jesus. 25 God presented him as a sacrifice of atonement, through faith in his blood. He did this to demonstrate his justice, because in his forbearance he had left the sins committed beforehand unpunished 26 —he did it to demonstrate his justice at the present time, so as to be just and the one who justifies those who have faith in Jesus. ‘It is because of him [God] that you [Christians] are in Christ Jesus, who has become for us wisdom from God—that is, our righteousness, holiness and redemption.